With the advancement in technology almost everything we use, from cameras and radios to books and music are based on digital technology. There's no denying that the digital age is well and truly upon us. Digital Signage is a form of electronic display that shows television programming, menus, information, advertising and other messages. Digital signs can be found in public and private environments, such as retail stores, hotels, restaurants and corporate buildings. Whether your goal is to turn shoppers into buyers, entertain the masses, promote your brand or run SMS competitions, digital Signage offers unique advantages over traditional signage. It can be used both in and outdoors and is capable of displaying customized, constantly changing high-quality video, graphics, text and sound. It is a dynamic communication tool that has allowed many companies to enhance their marketing messages, target key customers and enjoy successful results. This technology is referred to by a number of different names - captive audience networks, electronic display networks, digital dynamic signage, narrow casting data casting, digital in-store merchandising, employee TV, out-of-home media networks, retail TV, digital media networks, electronic billboards - whatever you choose to call it, there is absolutely no denying the benefits it can have for business. The key benefit of using digital signage is its rapid ability to change and update content to deliver specific messages to specific audiences in specific locations. Unlike traditional paper signage, it can be delivered within seconds of being created with the help of advanced digital signage software. Time and expense can be saved on printing, packaging, distribution, shipping, unpacking and mounting - being able to update, change or completely replace a marketing or sales message on-the-fly without replacing physical collateral can save businesses time, money and personnel hours, not to mention increasing advertising and marketing exposure. Digital signage displays are most usually controlled by personal computers or servers by way of proprietary digital signage software programs, avoiding any large capital outlays for the controller equipment. 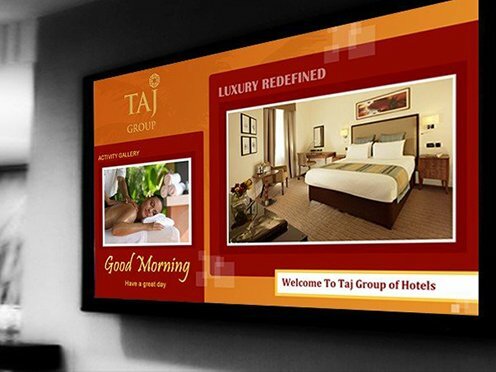 Advertising using digital signage is a form of out-of-home advertising in which video content, advertisements and messages are displayed on digital signs with a common goal of delivering targeted messages to specific locations at specific times. This is often called "digital out of home" or abbreviated as DOOH. Digital signage Solution is more beneficial compared to static signage because content that updates frequently can be digitally updated, saving the cost of printing. It also has the ability to be interactive with embedded touch screens, movement detection and image capture devices. Good signage exposes promotional messages at the right place and at the right time and attracts consumers' towards your business. Advertising is back born of every business with advertising a business never can grow. LED video wall is largest mode of adverting. LED Wall is basically in malls, cricket stadium for outdoor advertising.